There are only three things that teenage boys are interested in: food, girls and sports. The order may change depending on the kid, but these pretty much sum it up. Incessant video gaming counts as sports. Food will usually take a lesser position in the hierarchy…except when they’re hungry, which is all the time unless there are, well, girls and sports available. So the ideal vacation for a teen boy will bring all these things together (and where there’s an environment parents can enjoy, too). The simple solution: the beach. We told our 15-year-old Brandon that we were heading for the beach. He was only so enthused. It seems that hanging around at the local pool and posing for the girls there was a better choice. And how could he play his favorite video games at the beach? Was there anything to do? The suggestion that there were plenty of books to catch up on earned a derisive snort and a roll of the eyes. How could we be so lame? Boring! So it was with high hopes and one bad attitude in the back seat (“You’re going and that’s that!”) that we set off for the King and Prince Beach & Golf Resort on Georgia’s Saint Simon’s Island. At check-in, the soaring lobby and the relaxed yet elegant ambience assured that this would be no cramped sojourn in a rickety beach motel. Looking straight back through the famed restaurant, the tantalizing view of the ocean (the only oceanfront restaurant on the entire island) teased us with the promise of adventure after our long ride. We were taken to our villa, a modern, super clean and superbly equipped home away from home. The view through the big glass doors and the terrace was remarkable. A light breeze rippled the ocean. The tide was partly out so the beach was expansive and waves broke over some sandbars right out front. Directly below, an enormous pool glistened bright blue. 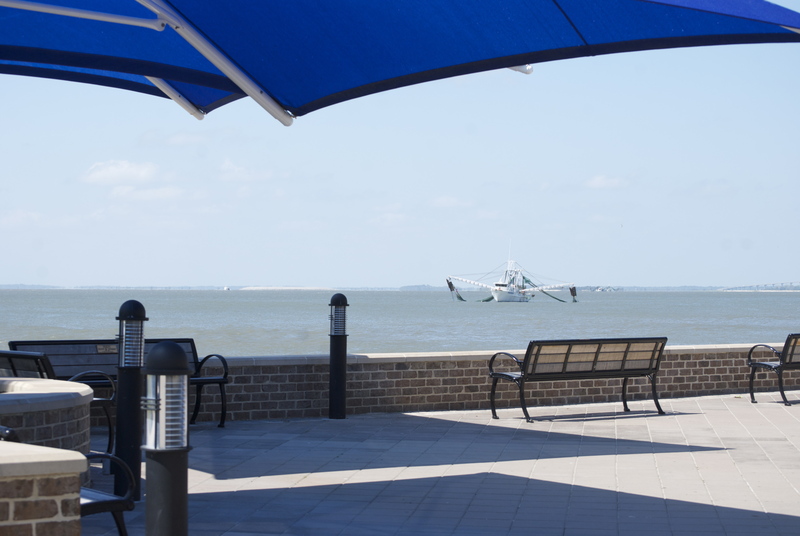 People were seated on a patio near the water’s edge at a snack bar. There were umbrellas and bikers and people strolling on the beach, swimming in the surf. It was colorful and…happy. We watched as he joined the group. A few handshakes, some shy glances at the girls, and the football regained the air, with Brandon in the circle. After some texting, we all met at the restaurant. The high ceilings and ceiling high windows looked right over the surf. And the menu was even more impressive. The big, juicy Tavern Burger made Brandon smile, although he could barely pay attention to the food because one of the girls he met at the beach was at an adjoining table. 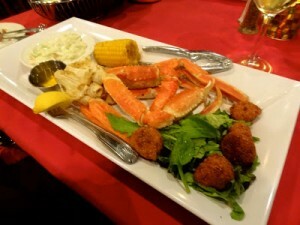 A signature King & Prince Crab Cake was a perfect appetizer, as were the savory Black Truffle Fries & Aioli. Then there was an amazing Crab Mac‘n Cheese, and a Low Country Shrimp & Grits, the King & Prince haute cuisine version of a perennial coastal favorite. If seafood hadn’t pleased, there were savory choices like Kurobota Pork, a whimsical Chicken and Waffles, a Short Rib Pot Roast and much, much more. The menu is large and creative, and dinner was incredible. After dinner, Brandon and a few of his new friends from the beach went out to the pool. The entire pool was lit and cast a bright blue glow. We all stood at the patio rail and watched the sea roll in and back. The stars were brilliant. Brandon said his good nights and came upstairs with us to our villa, after making plans to meet the next day. There was a bike ride for us all in the offing; Brandon and his new friends would ride up with us to the historic fort at Frederica, and we’d come back for lunch at the King & Prince, and then on to the beach for the afternoon. 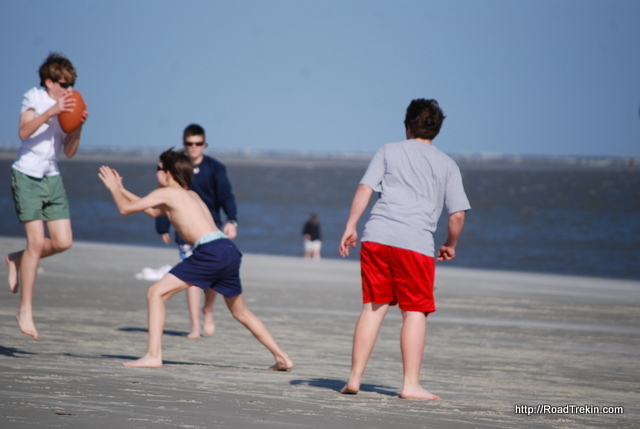 There was tennis in the plan for the next few days, along with a ghost tour and a ride on a real shrimp boat, and some fishing off the Village Pier, all planned with the helpful folks at the King & Prince. Our vacation couldn’t have had a better beginning. Look like we may have found a new family tradition. 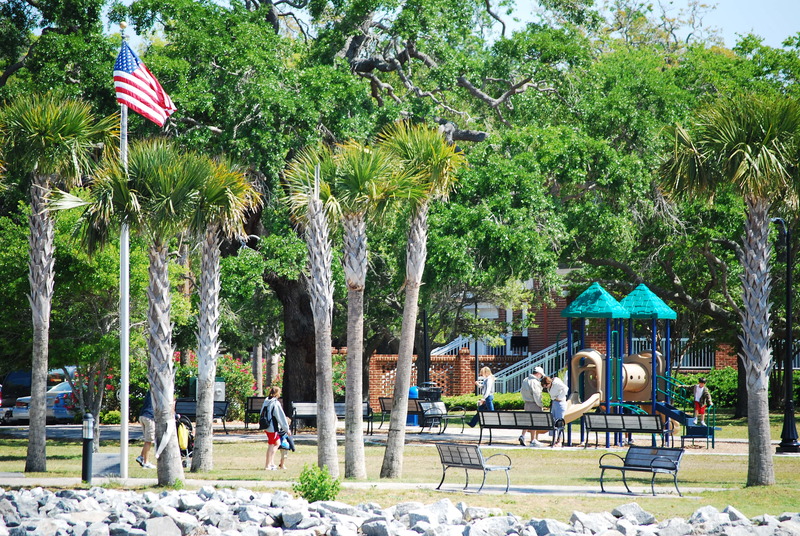 The southern tip of Georgia’s Saint Simons Island is a verdant park next to a friendly little town with great shops and some extraordinary restaurants. 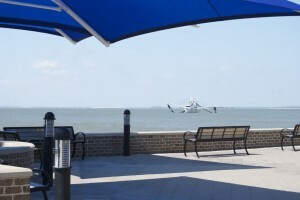 From the pier at the foot of the village, the view is across to Jekyll Island, and the passage between sometimes fills with looming super cargo ships passing by on their way in or out of Brunswick harbor. Several small hotels and inns are nearby, and it’s only a short stroll or bike ride from the celebrated King and Prince Beach and Golf Resort about a mile up the road or up the beach. 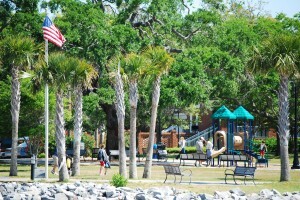 There’s a playground area for kids of all ages, sweeping oaks and waterside benches looking across the way and out to sea. The famed Saint Simon’s Lighthouse stands guard there, with its tales of illicit love, violence and ghosts. But it’s a tale of loyalty, transcendent friendship and bitter irony that defines the spirit of this place, known as Neptune Park. In the 1830’s, the lower part of the island was owned by the King family, and operated as the Retreat Plantation. Like all plantations of the day, it was self-sustaining. The Kings grew their own food and raised their own livestock, and raised cash crops like cotton and indigo to sell or trade for the things they needed. Like all plantations, it was a place of wealth and power, and its labor was done by a small army of slaves. It was the custom of the times, when a child was born to the owners of the plantation, for them to reach into their community of slaves and choose a young child to be a playmate and companion for their own child. 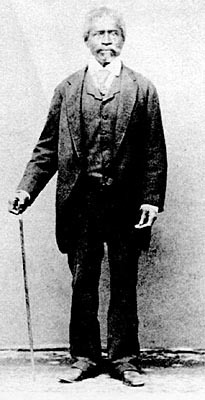 When Henry Lord Page King was born in 1831, the King family took the slave baby Neptune Small into their house to be friend, playmate, and eventually manservant to young “Lordy” King. The two boys grew to be fast friends. They did everything together. They hunted in the rich forests of the island. They fished and swam up the east beaches (where the King and Prince stands now, and up to where the old Coast Guard Station would later be built). They took their lessons together, and although it was rigorously against the law, Mrs. King also taught Neptune to read and write. While Neptune was not free and in the service of his master, the relationship seems to have been more secured by friendship than slavery. Lordy King grew up to study law and opened a practice in Savannah. On the plantation, Neptune married his true love and had a daughter. The hostilities between the states broke out, and in 1861 Lordy King enlisted to fight. As was the custom amongst aristocratic families, the men took a manservant with them, and Neptune went north to serve his young man. King fought valorously at the Peninsula in Richmond and at Sharpsburg, and witnessed the fall of Harper’s Ferry. He seemed invincible, and when a dangerous mission emerged, he was the first and only volunteer. Lordy was the aide-de-camp of the commander of the division. During the battle at Fredericksburg in December 1862, orders needed to be carried across the battlefield to one of the Brigadier Generals. Instructing Neptune to stay at the camp, Lordy set off to deliver those orders. When night fell, Lordy King had not returned. In the black of night, Neptune went out onto the battlefield to find his friend, and found him killed. At that point, Neptune was a free man. The law had emancipated him, and his ”owner” was dead. He could simply have walked away. Instead, Neptune Small gathered up the body of Lordy King, and braving the shells and fire of the battle, took him off the battlefield, built a coffin, found a wagon, and carried him from Fredericksburg, Virginia all the way home to Saint Simons Island. Lordy’s younger brother Richard had enlisted, and Neptune went off to be his servant and protector. He was told that he could stay home with his family, but he refused. When the war ended, Neptune returned, with Richard unharmed. But they returned to a devastated, destroyed Retreat Plantation, occupied and then razed by Union troops. There was no food and no money, but as recognition for his bravery and loyalty, the King family granted a parcel of land from the old plantation site to Neptune Small. He lived there until his death in 1907. 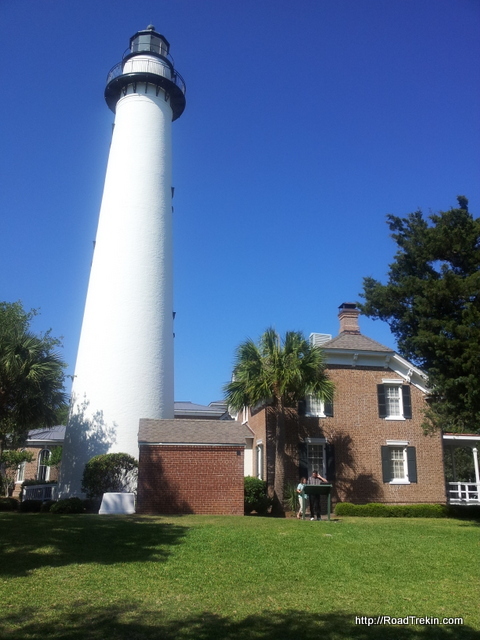 Lordy King and his family are buried at the cemetery at Christ Church, in a majestic family plot, like those of the other plantation and luminary families of Saint Simons Island. Neptune Small is buried at the former Retreat Plantation, presently the site of the Sea Island Golf Club. A more fitting memorial, Neptune Park, is the former slave’s old homestead at the tip of Saint Simon’s Island. It stands in testament to the simple human attributes of loyalty and friendship honored by all men and women everywhere. 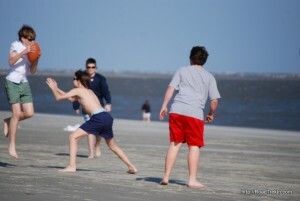 To learn more about the remarkable history of Saint Simons Island, and to see it for yourself, contact the King and Prince Beach and Golf Resort at www.KingandPrince.com. Let’s face it. For most of us, spending time with our girlfriends consistently slips to the bottom of our to-do lists. But stealing away for precious time together can do wonders for the spirit – and bring us all back home with a renewed enthusiasm for all that we do. So when my group of my favorite metro Atlanta gal pals floated the idea of a girls’ weekend, we quickly settled on the perfect destination: the legendary King and Prince Resort on St. Simon’s Island. Just a few hours drive, it gave us the chance to let our hair down and reconnect without everyday distractions. Now before I share a few of our (edited for publication!) antics, I’d like to introduce the motley crew in our posse. Full disclosure: I’ve changed the names to protect the innocent, but I’ll bet you’ll recognize a few of these personalities among the women in your own life. lover of architecture. The last member was Katie, Scottish by birth, and interested in all things historic and representative of the Old South. We piled into my mini-van (hip, right?!) and headed down to the King and Prince Resort on a Friday afternoon. With every mile, I could feel the tension slipping away. Our group grew more excited as we traveled. Other than a few arguments over music and where to stop for snacks, we had a peaceful journey. When we finally arrived at the King and Prince, all of us were inspired by its grand architecture. This was going to be a weekend to remember! We checked in with plenty of time to indulge in the resort’s restaurant for dinner. After hearing about this fantastic repast for more than a decade, it was wonderful to finally sample it for myself. We all enjoyed ourselves – and the luxury of enjoying wine with dinner without having to drive home. It took me a while to decide, but I finally splurged on an appetizer of mussels and grilled sourdough, followed by the Low Country Shrimp and Grits. You only live once, right? My meal was unbelievable, with fresh shrimp and really creamy grits. I told our waitress I wanted to recreate it back home for my family and turns out the recipe is already posted online. (Low Country Shrimp and Grits Recipe). The other ladies were also thrilled with dinner. Jackie ordered the Char Cedar Salmon, which came with a fantastic corn bread pudding and a vegetable I had never tried before called broccoli. Landlubber Pam opted for dry rubbed “Kurobuta” pork with candied yams and some kind of a bourbon glaze. Evelyn and Jackie both wanted Chicken and Waffles, which was served with an adorable tiny bottle of tabasco sauce. Instant souvenir! 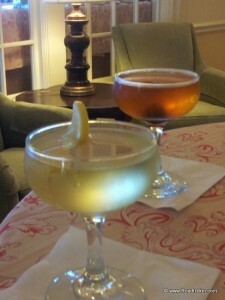 I’m not at liberty to discuss our libations, but believe me, everyone left dinner happy and very mellow. The resort itself was as spectacular as our meal. With its soaring ceiling and intricate moldings, The King and Prince transports you back in time to gentler age. The vast main lobby lifted our spirits the moment we arrived. It was like the clouds had parted, freeing us to be our true selves and simply enjoy each other’s company. Our fully appointed two bedroom, two bath Tabby House suite was complete with all the comforts of home (without all the dirty socks, sports equipment and backpacks, of course). You could see immediately how much care had gone into the decoration of every room, from the beautiful brocade draperies to the high thread count sheets. I wish our house back in Norcross was as nice! After dinner we slipped into bathing suits and cover-ups and strolled over to the pool area (there are three on the property!) to melt in the indoor hot tub and take a dip. Virtuous Jackie insisted on swimming some laps to burn off her dessert. The rest of us just climbed in and let the hot water ease away the stresses of everyday life. It felt so magical, I’m thinking of adding a hot tub to next year’s holiday wish list. Saturday morning we took a short walking tour of downtown St. Simons. The little shops were full of unusual gifts and specialties like packages of flavored grits and candied nuts. Our crafter, Evelyn, was inspired by seeing so many handmade creations. I think she bought one of everything. Sure, there were plenty of souvenir t-shirts. But I was amazed by the availability of nicer, boutique dresses and beachwear. Those in need of a new swimsuit, summer cocktail dress or resort-worthy earrings won’t be disappointed. For a split second I regretted having ordered dessert the night before. For lunch, we headed for a heavenly little spot the Concierge recommended: “Iguana’s” which was filled with tourists and locals alike. In minutes, our table was piled high with crispy fried shrimp (dubbed “the island’s best” multiple years running), shrimp po-boys, giant caesar salads with grilled salmon and a tantalizing platter of assorted roasted oysters. As the grand finale of our afternoon, we took a breathtaking kayak trip with Southeast Adventure Outfitters. We headed out to the marsh led by an experienced tour guide, and spent a blissful couple of hours watching egrets, pelicans, and a glorious sunset that made it seem like we were worlds away instead of on the Georgia coast. The peace wasn’t lost on our usually talkative crew. Everyone grew quiet and enjoyed moving across the water as the tide gently rocked our kayaks. Our weekend was such a raving success that we went ahead and booked another trip for next year. Somehow, I’m sure that juggling everything on my plate will be easier with another visit to the King and Prince to look forward to! Contact the King and Prince to set up Your Girls Weekend of Fun!